The United Methodist Church is made up of connectional disciples with open hearts, open minds, and open doors in order to help transform the world. We would like to have the opportunity to get to know you and have you get to know us. Our Mission is to “Live and Love as Christ.” This means that we not only serve God within the church walls but we also desire to serve God outside of the church walls. We invite everyone to experience the love and grace of our Almighty God. 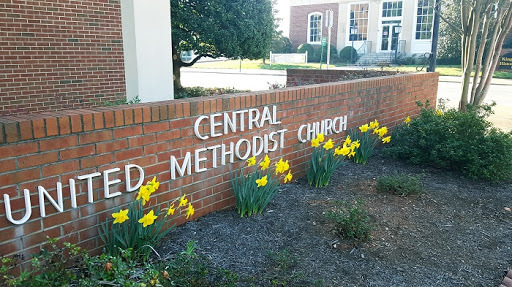 Central United Methodist Church was originally organized as Central Methodist Episcopal Church, South, in 1874 (the same year that the city of Kings Mountain was organized and chartered). In the beginning, the church met in a one-room school house. In 1876, Central built their first church building – a one-room frame building which stood on the corner of Mountain Street and Piedmont Avenue (where the police department currently stands). The first Sanctuary was built in 1905 (where the current Sanctuary now stands). An education building, which included a dining room and kitchen, was dedicated in 1959. When it was discovered that the interior brick was deteriorating in the Sanctuary, the process began to replace that building. On June 11, 1967, the first service in the new Sanctuary was held; we continue to worship in that Sanctuary. God has blessed Central with beautiful facilities and with people who have a vision that uses the facilities to reach out to people in our community and in the church. The Community Kitchen serves approximately 700 hot meals per week to the needy in Kings Mountain and surrounding areas. Boy Scout Troop 93 and Cub scout pack 193 offers Scouting to boys in our area. Exercise groups include the walking group and a Zumba class. Our outreach also extends internationally. In 2013, we sponsored a team to Costa Rica. Plans are currently in place for another team to travel to Costa Rica, including some who will stay several weeks in the country. The Carpenter’s Clubhouse Pre-School serves 2-4-year-olds in a half-day setting. We have a very active United Methodist Men’s group as well as the United Methodist Women. Both of these groups minister both inside the church and to the community. Our Youth Ministry, led by Aaron Simmons, includes the Kids for Christ (5 years – 6th grade) and the United Methodist Youth Fellowship (7th– 12th grade). Bible studies are offered (short term and long term) throughout the year. The music ministry offers opportunities for children (children’s choir) and adults. Our Chancel Choir sings during the traditional service. The praise and worship band and team lead the praise and worship service. The Bells of Praise (hand bells) present music during the traditional service and also presents a concert at Christmas. Drama is also included during both worship services. Whatever your gift, there is a place for you at Central United Methodist Church. We look forward to worshiping and serving with you.